The battle of the Mid-Autumn Fest gift boxes is on again! While I don't have time to suss out every single one in the market, I was smitten with five exceptional designs which stood heads and shoulders above the rest this year. Taking the lead once again in my personal preference chart is Concorde Hotel KL's classy lacquer jewellery boxes. I especially love the red box adorned with peonies. Coming in a close second is the floral and ribbon decorated one in maroon. Priced at RM108 (there's a 15% discount for credit card holders! ), each celebratory gift box contains 6 pcs of baked mooncakes (60g). A thoughtful addition to the box is the plush suede bag with gold drawstrings to complete the plush presentation. Inside, the red felt-lined case holds six gold sheen boxes containing the mooncakes. Set A comprises Japanese red bean, pure lotus single yolk, golden pandan pure lotus, white pure lotus, assorted fruit & nuts and green tea pure lotus paste variants. For Set B, the mooncake flavours include golden pandan pure lotus single yolk, white pure lotus paste single yolk, green tea pure lotus paste, Japanese red bean, pure lotus and golden pandan pure lotus paste. The boxes have been such a runaway hit since its launch so it pays to be an early bird and grab them while stocks last. Call Concorde Hotel KL, tel: 03 2144 8750 for more information and details. After tasting sweet success last year, Komugi has returned with its range of Otsukimi mooncakes. In Japanese, otsukimi means moon viewing which usually takes place during Jugoya, the Japanese festival of paying homage to the autumn moon. The dark blue box captured my heart with its whimsical white rabbits design frolicking around a shiny full moon, referencing the country's legend about a rabbit pounding mochi (rice cakes) with a wooden mallet that lived on the moon. Every part of the gift box is meticulously construed, from the magnetised lid to the inside cover highlighted with poems; the boxy square shape fitting four pretty gift-wrapped mooncakes nicely. Low sugar premium lotus paste with peanut oil encased in thin baked pastry is the classic flavour to satisfy purists. But I found the inventive variants more interesting, starting with the German black forest. Dark chocolate paste studded with black currants and sweet cherries quickly reinforced its seductive appeal with yours truly. I adore the fudgy texture which appeared lush and rich on the palate. A small wedge washed down with freshly brewed green tea won't go remiss I tell you. The distinctive azuki (Japanese red beans) taste and aroma was unmistakable in the third variant. At the core of it was a nugget of fresh milk and nuts paste, rendering the mooncake with an agreeably delicate richness. Like a golden moon hidden from sight, the enticing apricot centre of Komugi's green tea apricot proved to a real gem. I enjoyed the fresh astringency of the green tea accented mooncake with its premium lotus paste filling. Besides mooncakes, Komugi is renowned for its Baumkuchen - a unique layered cake. Originally from Germany, Baked one layer at a time on a rotating spit over an open oven, Baumkuchen means tree or log cake as its circular baked layers look similar to the 'rings' of a tree trunk. Butter, vanilla, eggs, sugar, flour and salt combine to create this rich, delicious cake which comes in different flavours. Dark and bewitching, the black sesame Baumkuchen I tried was spongy soft with hints of nuttiness to it. A fabulous treat to indulge in or even better, presented to family and friends as a delightful gift. Designed to resemble a vintage travel trunk with multiple compartments, the red and gold Mid-Autumn gift box from Dorsett Grand Subang is worth grabbing. Embellished with intricate Oriental motifs including birds, butterflies and flowers among others, each of the four pull-out compartment cases hold a mooncake inside. Three new flavours: baked ginseng goji berry, baked white coffee durian and crystal skin peppermint chocolate mooncake have joined the line-up available. Eight other classic fillings are also featured to please traditionalists. I was quite impressed by the ginseng-infused mooncake - the herbal nuance was subtle enough and balanced by bits of kei chi or goji berries in the lotus paste. Durian and white coffee may be strange bedfellows but in this instance, the combination works for me. The low sugar quotient also means the confectionery isn't too cloying while the heady king of fruits aroma meld well with that of white coffee. A winner in every sense. Since I'm not a big fan of minty dessert, the peppermint chocolate version doesn't rock my boat. Those partial to cool minty freshness may beg to differ but personally, I'd avoid this particular creation as it tasted like toothpaste to me. Dim Sum Chef Chan Chee Looi from The Emperor restaurant stepped up to the plate and showed us the art of knocking out these Mid Autumn Fest treats. We spent some time admiring the sturdy wooden mooncake moulds with their intricate etchings while he mixed up the necessary ingredients to make the crystal mooncake skin. He made everything seemed so easy but having tried my hand at making mooncakes last year, I can assure you not everyone is cut out for the job. Anyway, the chef was incredibly patient in explaining the various steps and methods during the demonstration. We were left impressed by his dexterous skills and had a good chat with him about the various fillings, especially why he chose to introduce the three new flavours this year. According to Chef Chan, his customers prefer tried and tested flavours but would accept minor tweaks or updates to perennial versions when the formulations hit the right note. Priced from RM25 onwards, the mooncakes will be sold until 15 September 2016. For enquiries, call Dorsett Grand Subang, tel: 03 5031 6060 x 1954. 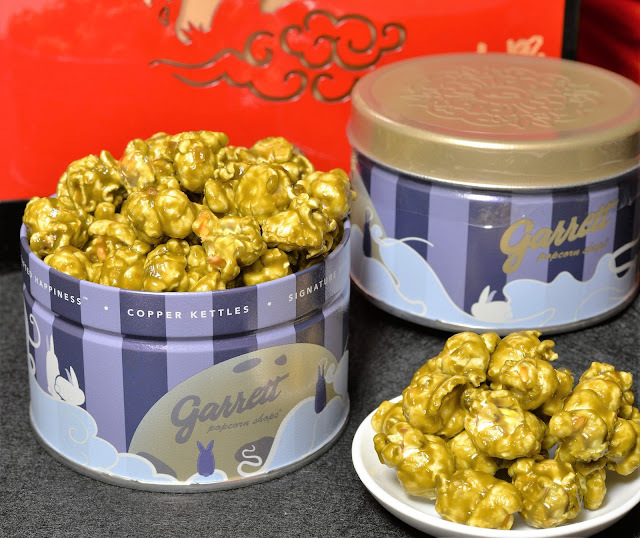 Getting into the spirit of the Mid-Autumn Fest is surprise, surprise...Garrett Popcorn Shops! The cute Jade Rabbit Tins with embossed lids bearing ornate floral pattern similar to that of the traditional treat are collectible items, especially for fans who already own the different Garrett Tins. Set against the blue striped background is several bunnies amidst swirly clouds...the slightly shiny effect looks far better when seen up close. Somehow online images don't do the Jade Rabbit Tins justice. I suggest you visit the nearest Garrett Popcorn Shops at KLCC, 1Utama, Mid Valley or gateway@klia2 to check them out. 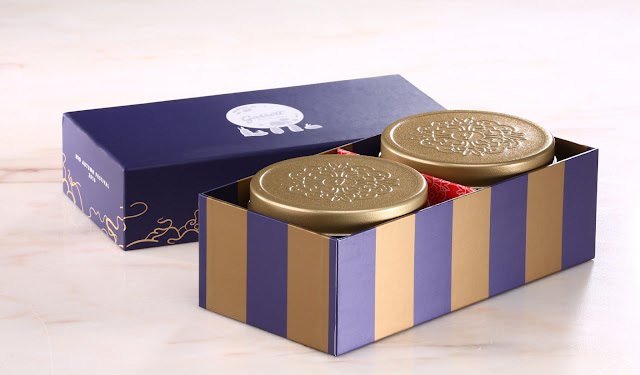 The Mid-Autumn Gift Set comes presented in a rectangular box too which makes the two TIns easy to carry once they are filled with your preferred popcorn flavours. 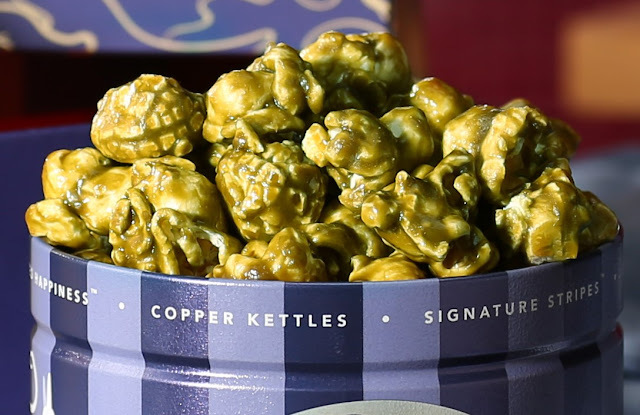 Besides Chicago Mix, you can choose Matcha CaramelCrisp - the green tea variant popcorn has made a return for the occasion till end September. 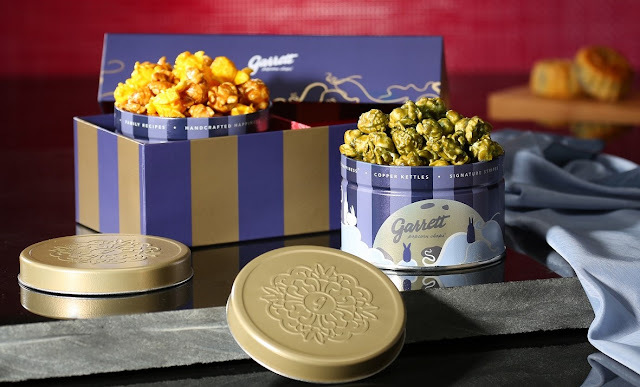 Priced from RM54 onwards per gift set, the Mid-Autumn Gift Set from Garrett Popcorn Shops may just add more cheer to your family and friend gatherings during this happy celebrations.